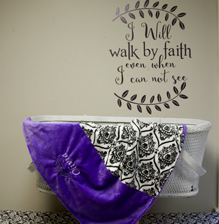 We are excited to introduce you to Walking by Faith embroidery! to our list of products and services that we offer here at Grebinger Gallery! Cindy has come from a long line of "crafty women!"... women who knit, crochet, cross stitch, sew and has always loved creating baby hats, blankets, samplers, capes, dress up dresses... the list goes on and on! This fall we finally invested in a commercial embroidery machine to add that personalized touch to many of her creations. We are excited to introduce you to the first of her items she has created! soft and adorable fabrics for her Minky baby blankets. Each blanket has a solid color minky on one side, and an adorable coordinated print minky fabric on the other. Mom and little one for years to come. Embroidered onesies and burpy bibs! Another great gift item for a little one are Cindy's adorable embroidered onesies with matching burpy bibs. Onesies come in sizes from 0-3 months to 24 months, long or short sleeved. Cindy has carefully chosen 8 different designs ranging from our "happy camper" featuring retro campers! to an" a-roar-able" friendly lion cub! Each onesies has a coordinating burpy bib... sewn with print flannel on one side and soft terry on the reverse. These can be used as a burp cloth and later as a feeding bib. 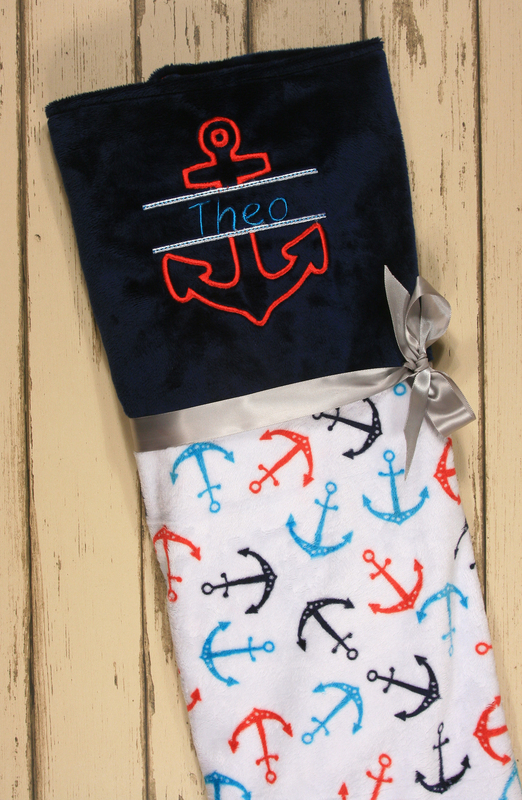 Your little one's name can be added to the bib for a small additional charge.